A term “potential client” is well known to all business companies, within a CRM system such potential clients are called leads. Leads can be either people or companies, that are found in a number ways (e.g. on your website, on various conferences, through data exchange with other companies etc.) and then stored in Leads records. An effective leads management and its result – lead conversion are considered to be two main steps forward for the increase in sales and profits. What is lead conversion? Lead conversion is a process of converting your potential clients into current customers, in other words into accounts, contacts or opportunities. In order to do that choose the leads item from the navigation bar and you’ll see the your company’s list of leads and information about them. 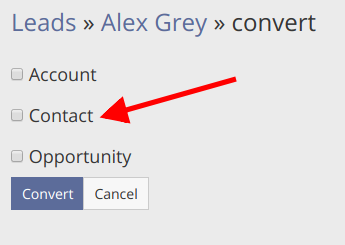 Then choose a lead that you want to convert, for an instance, we’ll convert Alex Grey and then press Convert button. As you can see the system collects all the existing data about the client on its own, so you have only to add or change something if needed. 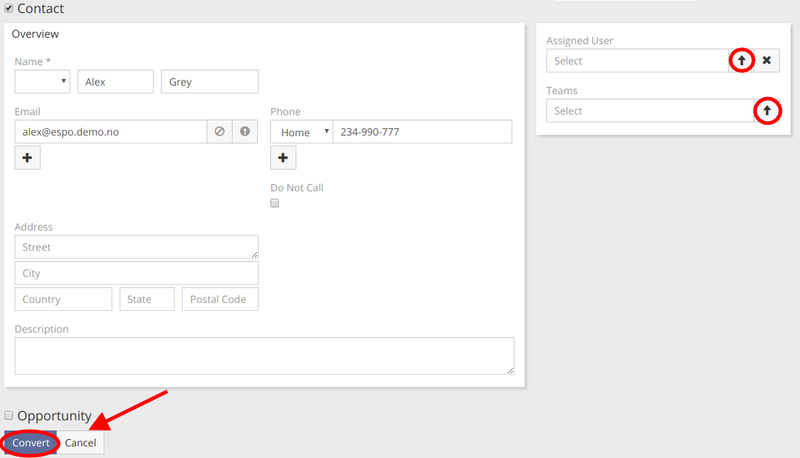 To assign newly created contact to a specific user or a team, you have to press the arrow button and choose them from the list. In the end, click Convert to create the contact. With Accounts and Opportunities the lead converting process is pretty much the same.